As you can see I like to mix and match a lot of my same pieces of clothing. In all these looks, I am wearing an off-white turtleneck. Two of my favorites are the one from The Limited (everything is 50% off today) - which is thinner and my chunky turtleneck from J. Crew. Also, these jeans are one of my favorites. I like to invest in a good pair of jeans - and then get a lot of wear out of them. My boots are OTK, but they can easily be scrunched down to be worn below the knee, which is perfect for me for work. OTK would not be appropriate in my work environment, but tall boots are okay. 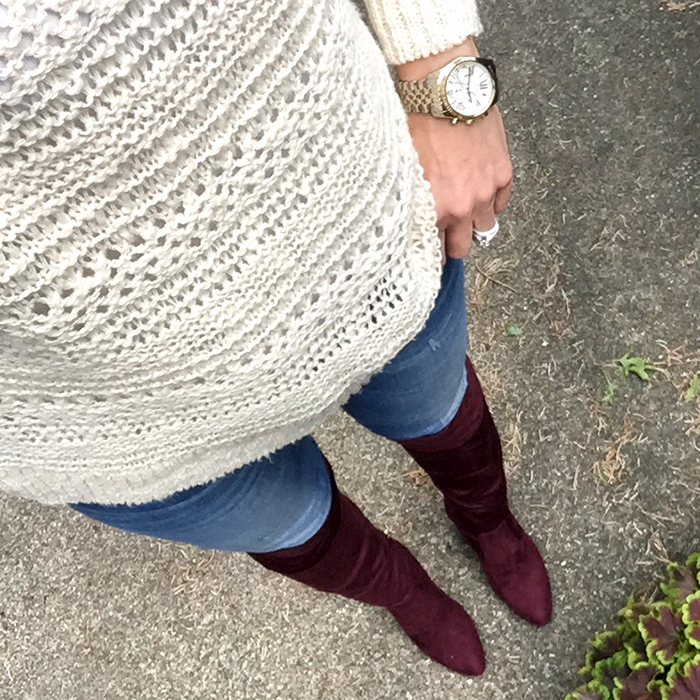 Plus, I have been looking for a tall pair of burgundy boots for a long time - and I finally found a pair that I like. 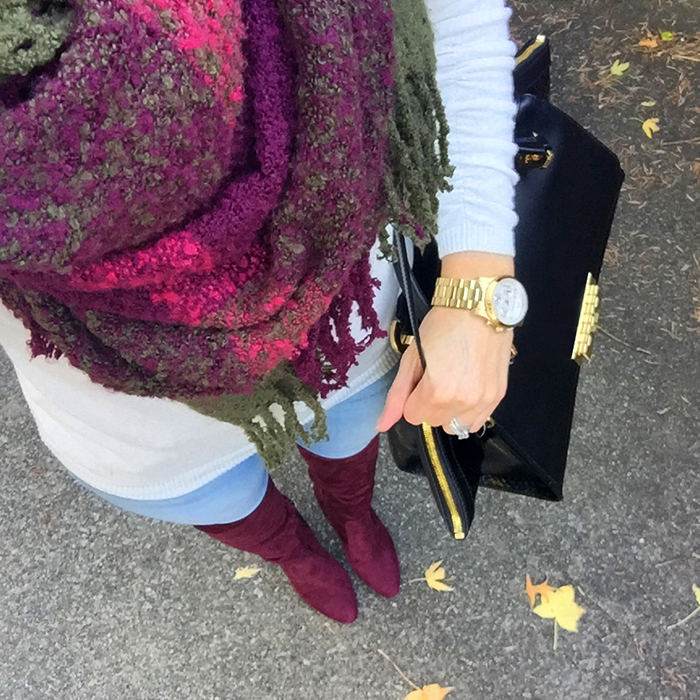 In all these looks, I have shown how just adding a the scarf - can change up a look. 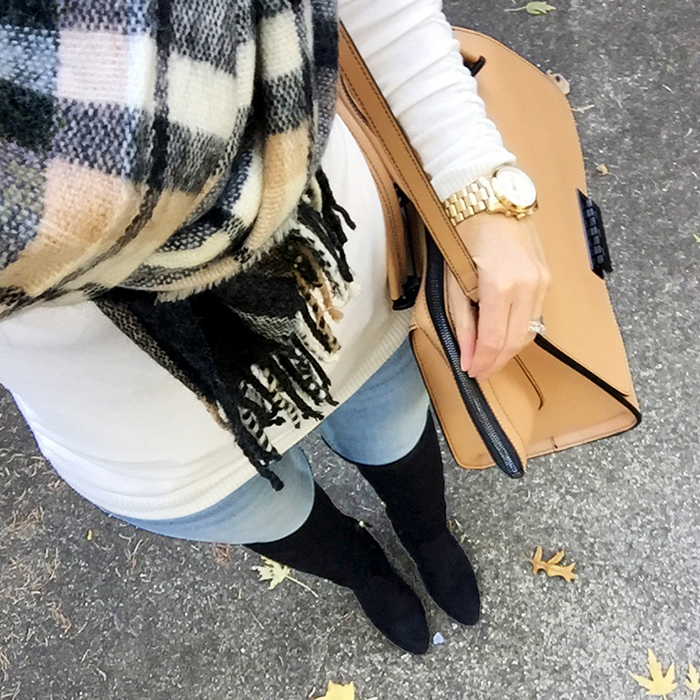 I am also guest posting on The Blended Blog today - talking about what to wear to all your Thanksgiving, Christmas and New Year's parties - on a budget. "Many of us fear that if we slow down even the tiniest bit, we will no longer be productive. We fear our lives will be meaningless if we aren’t constantly striving for something bigger and better. Yet when we finally stop chasing those impossible standards and surrender our fears, we become truly productive in what matters. We experience genuine fulfillment: an imperfect yet intentional life, driven by a clear core purpose." - Make it Happen: Surrender Your Fear. Take the Leap. Live On Purpose. 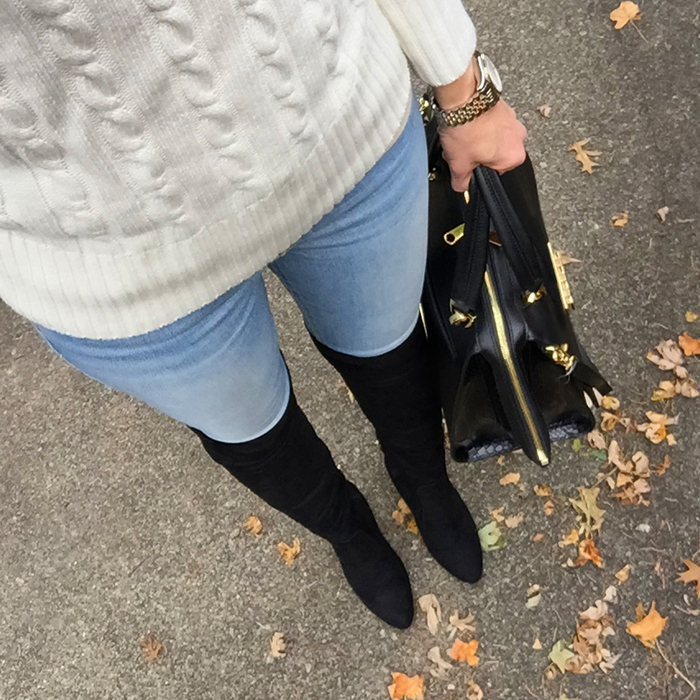 Aren't over the knee boots just the most amazing thing ever? They can really amp up a look, and all of these looks are so fabulous! I can't wait to wear mine more now that the weather is finally cooling off. I totally agree! I love how they look - and I am so glad the trend keeps on going. I have seriously considered ordering those boots. They look great on you! I'm obsessed with all things OTK right now. I highly recommend them - I have tried a lot of different brands - and I like these the best. They are comfortable and slouchy but stay up. Your OTK boots are amazing, I need to go check them out as I'm struggling with finding the right pair for myself!! As always these are all great looks! Thanks, Marta. I would recommend these OTK boots. These are the first pair I have found that are comfortable and easy to wear. Those boots look gorgeous! I especially love the wine color. Your OTK boots are so pretty! I really like the outfits you created with them! Have a great day! Won't get enough of those OTKs! You rock the OTK boots like nobody's business!! Great looks!! Those boots are killer and I love the color! Thanks so much for linking up with us and hope to see you next month!